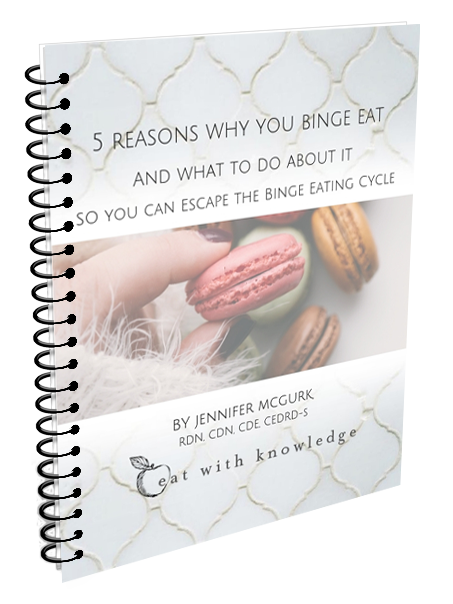 If you want to heal from binge eating and feel fabulous about food, this guide is for you! It’s very normal to overeat delicious food. But if you regularly “overeat” to the point of feeling stuffed and uncomfortable, your behavior may be “binge eating”. Binge eating is defined as eating a large amount of food in a short amount of time. It’s important to recognize the typical thoughts and feelings associated with bingeing that make it different from occasional overeating. Binge eating can make people feel trapped in a cycle of behaviors that lead to a sense of guilt and shame about food choices. Sometimes to a point where they believe they cannot trust themselves around food. Binge eating is very common in people who are dieting, as restriction fuels the binge eating cycle.